Omega 3 index is the very latest and most accurate cardiac risk factor. Omega 3 heart health is about the relationship of omega 3 fatty acids to mitochondrial integrity and endothelial health. Sudden cardiac death claims 250,000 people a year in the US. New research has established that omega 3 fatty acid levels directly correlate with both sudden cardiac death and overall cardiac death. overall cardiac death by 25%. The test is called Omega 3 Index, and is destined to be the most important new marker for cardiac risk factor. This new test and the marker that it establishes is destined to become the primary marker for overall heart health and cardiovascular disease risk. Omega 3 heart health is about controlling inflammation and promoting mitochondrial integrity. For several decades cholesterol levels and profiles have dominated medicine as risk factors for cardiovascular disease. Recommendations for cholesterol levels keep going down as pharmaceutical companies influence official medical guidelines. This is unhealthy as cholesterol production by the body is both natural and essential to many critical functions in the body and brain. Cholesterol as a marker for heart disease leads to increasing use of statin drugs with their dangerous and debilitating side effects. Omega 3 index is a brand new marker for cardiac risk factor, which unlike cholesterol level, encourages the promotion of healthy levels of omega 3 fatty acids in the body, which have undeniable health promoting effects. Thus a doctor or clinician can assess risk of cardiovascular disease with this test, and recommend omega 3 supplements to bring about optimum omega 3 heart health, and reduce the risk of cardiac mortality by almost half! Omega 3 index as a cardiac risk factor actually encourages maintaining healthy levels of omega 3 fatty acids, rather than dangerous reductions in total cholesterol. The test which was developed by Dr. William S. Harris PhD and produced by OmegaQuant LLC is available directly from OmegaQuant or through your health care practitioner. It is done with either of two collection methods, blood tube or finger stick, which yield two different sample types, red blood cell (RBC) or dried blood spot (DBS), respectively. Both the RBC and the DBS tests include the HS-Omega-3 Index® as well as the full fatty acid profile. The test doesn't require fasting unless you have consumed a dietary omega 3 source such as fatty fish or fish oil, which would then require you to wait 12 hours before collecting the sample. The sample is then mailed to OmegaQuant and the results will be available online in 3 working days. There are reference ranges included for all 5 subgroups of fatty acids. The reference ranges are only for the purpose of comparing the result with population averages. They do not denote optimal levels. The target range for optimal omega 3 levels is 8% and above. This result is associated with a 90% reduction in cardiac risk factor and optimal omega 3 heart health. 4% or below is associated with the highest cardiac risk factor. Eating oily cold water fish such as salmon, mackerel, bluefish, or by consuming a premium pharmaceutical grade fish oil supplement. 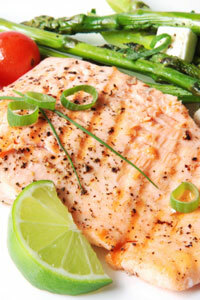 Both these sources should be used as it is not easy to get the required amount of omega 3 fatty acids from diet alone. The following guidelines apply to the use of fish oil for this purpose. The importance of the Omega 3 Index is that it establishes what your omega 3 fatty acid levels with scientific accuracy are and provides specific recommendation for reducing your cardiac risk factor and ensuring optimal omega 3 heart health. This is much more effective than just consuming omega 3 supplements like fish oil and guessing. Used correctly the Omega 3 Index is the most effective way of lowering your risk of cardiovascular disease and ensuring optimal omega 3 health!